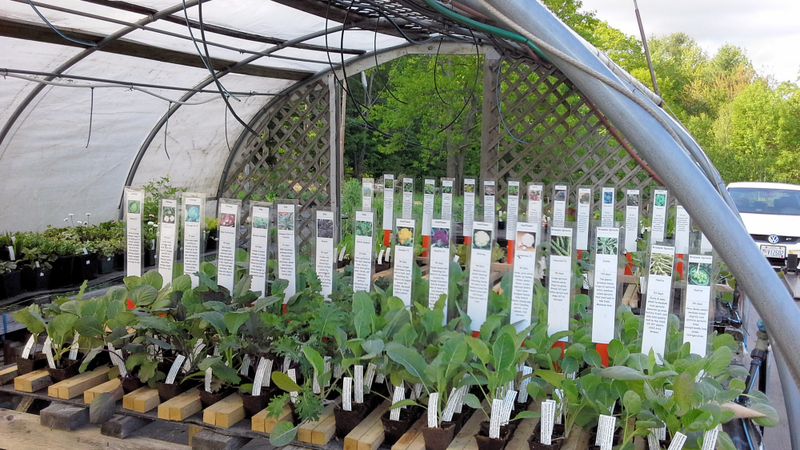 This email has lots of info about vegetables, hints on fertilizing your plants which might be helpful this rainy season, and more workshops (our Companion Planting Workshop got rescheduled to this Saturday at 10:30). Enjoy, and as always, please share this info with people you think might be interested. Last weekend we sold out of a number of varieties but our second planting has rooted in nicely and will be ready by the weekend. Since you can now get individual, mix & match small peat pots, you might want to experiment a little and try this or that new veggie that you’ve never grown before. And you don’t need to get six tomatoes, you can get a tomato, a pepper, a Brussels sprouts, a Swiss chard, etc. By the way, Swiss chard is very nice. It is packed with vitamins, has anti-inflammatory and blood sugar-managing properties, and you can keep harvesting the leaves all season, going even through frost. Plus it adds beautiful colors to your meal! Bright Lights is an All America Selections Winner, and Golden Chard is a delicious and beautiful heirloom variety. Each of the colors has a slightly different flavor. 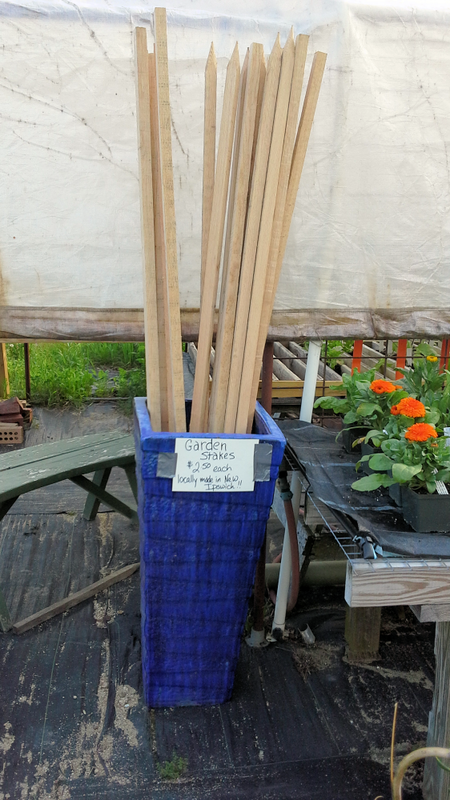 6′ Garden Stakes…for tomatoes, trellises, strong oak, point sharpened on a giant pencil sharpener, LOCALLY MADE right here IN NEW IPSWICH! One of the fertilizers we use–organic, versatile, easy to use, convenient, and lasts for about a month. So you probably won’t need to fertilize very much. Slow-release fertilizer has a special covering that lets out nutrients depending on temperature, mostly, and also moisture. 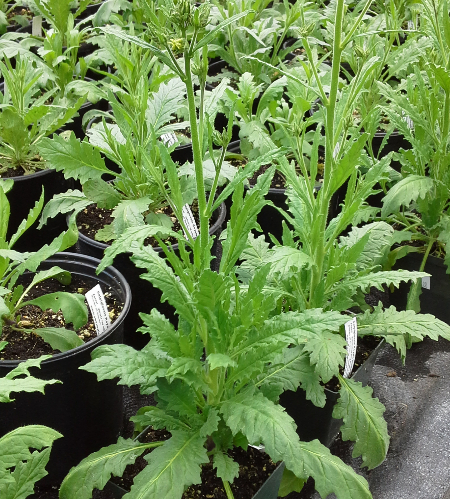 What we added should last through the summer, but if you see symptoms of hungry plants, like spindly new growth, noticeably smaller flowers, or chlorosis (significant paling or yellowing) of the leaves, you could water with some fertilizer. • Excessive water (including rain) that washes the nutrients out of the containers. If you notice water pouring out of your containers you might have this situation. Once the soil has had a chance to dry down and needs watering again, you could use a dilute fertilizer solution. • Very high temperatures. The slow-release fertilizer we use (Nutricote) releases smaller quantities of fertilizer when it is colder and the plant is growing slowly, and higher quantities when it is warmer and the plant is growing faster. If it gets very hot, make sure to keep your plant watered so the roots can make use of this extra fertilizer. 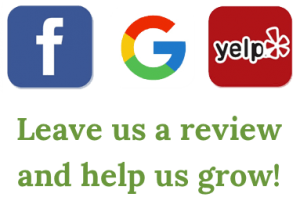 We select our fertilizers based on giving the plants what they need and making our (and your) life easy. We have convenient small bags of what we use in our plants near the register. • For the annuals and perennials we use Nutricote with Micro-nutrients—a complete, 140-day slow-release fertilizer which is easy to mix into the soil, or simply top-dress if you want. • We use Sustane, a granular organic fertilizer in our veggie starts; it lasts for 30 days or less. 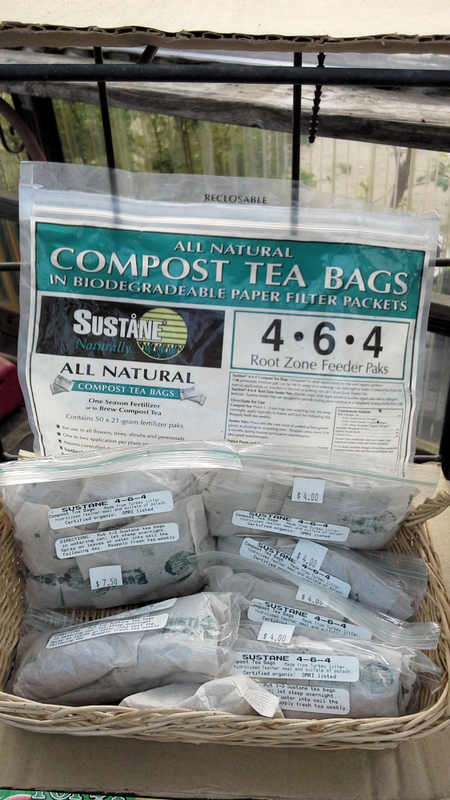 The Sustane is kind of nice because it is pre-measured into “compost tea bags” which you can use in many ways. Lay it on top of the soil, open it and mix it in the soil, or simply put one or two bags in your watering can for a couple of hours or overnight if you prefer, and now you have an easy, gentle compost tea you can water with. You can use this on anything that needs a boost. Sustane does not have an odor. • Of course, for the vegetable plants in the garden, our own Chicken Gold works wonders. (We don’t recommend using it on plants in containers—too easy to overdo it.) Our Chicken Gold has been mixed and aged for two years before we put it in the red bags for you. Work it into the soil before you plant. Over time, rain and water will spread those nutrients throughout your soil and attract earthworms. 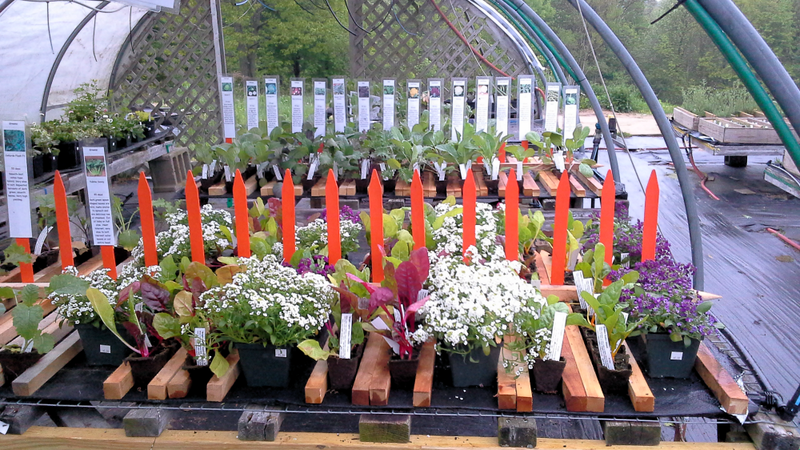 You may notice our beautiful Swiss chard/spinach table, where we’re mixing alyssum in with the vegetables. That’s not just because we love beautiful flowers. Alyssum is a powerful “pollinator plant.” Its continuous multitudes of fragrant, nectar and pollen-producing flowers attract loads of beneficial insects. These not only pollinate, some of them, like hover flies, attack insect pests such as aphids in the garden. Placing alyssum near spinach and Swiss chard is said to help deter leaf-miners which like to get inside the leaves and eat serpentine channels. Adding alyssum or marigolds to your vegetable garden is an example of companion planting; intermingling plants that enhance your vegetable production. 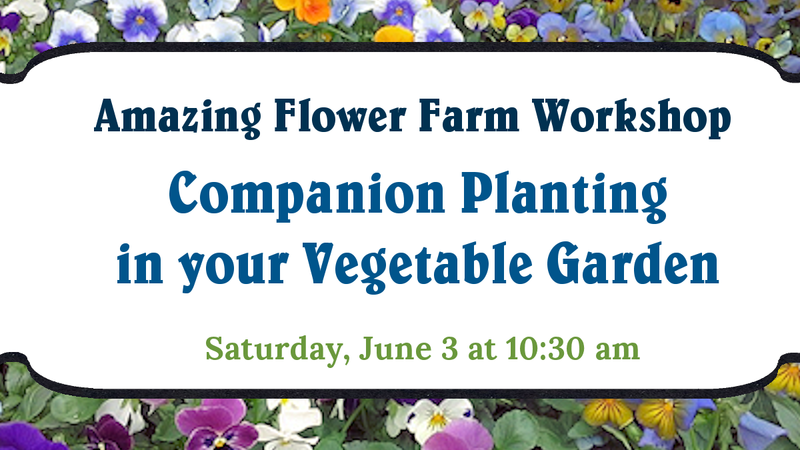 Our re-scheduled Companion Planting Workshop is now this Saturday, June 3 at 10:30 am. Christine Johnson will share tips on herbs and flowers that you can intermingle in your crop rows to bring benefits to your garden. • Some, like alyssum, are great attractors of beneficial insects and pollinators. • Other plants suppress certain soil-dwelling pathogens and pests. 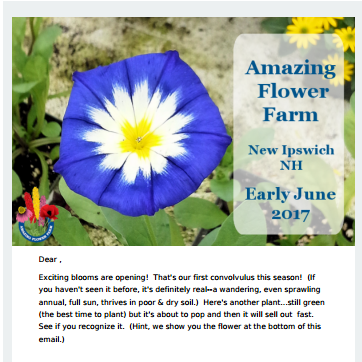 • Some are edible flowers, adding flavor and interest to your harvests as well as color to the vegetable garden. Click here to preview our upcoming Successful Container Series Workshops. OK, we promised. This is what that mass of green is going to reward you with soon. 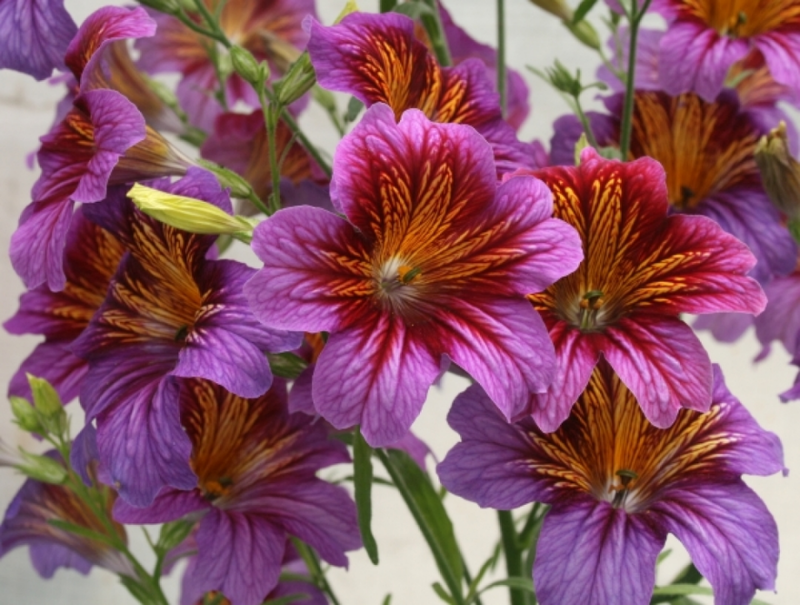 This is Salpiglossis Royal Purple Bi-Color. We may have a few Royal Red Bi-Color this year too. 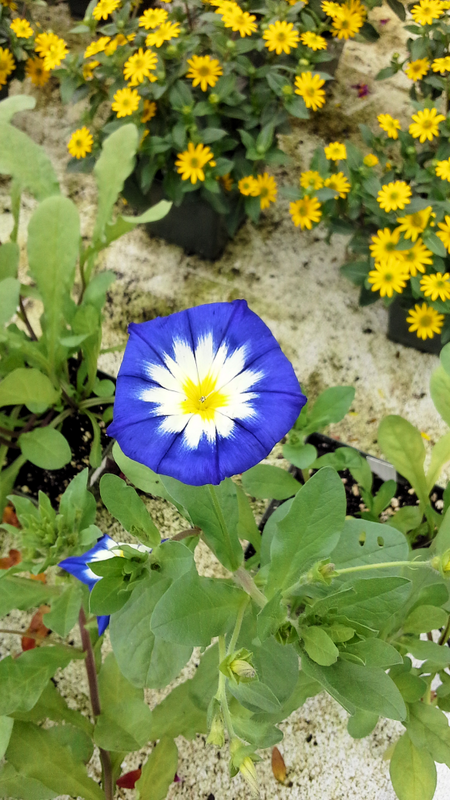 The Red Bi-Color is going out of production in the seed industry now, so we are going to try saving our own seed so we can continue to offer these spectacular annuals.